In 2011, the Maryland Department of Natural Resources (DNR) along with the National Park Service (NPS) and the U.S. Fish and Wildlife Service completed the reconstruction and relocation of the Point of Rocks boating access facility. The location is approximately 900 feet downstream from the old facility, which was near the U.S. 15 bridge across the river, and allows boaters easier access to the river using a new two-lane concrete boat ramp. The updated, ADA compliant facility also includes a comfort station, 24 trailer parking spaces, 18 additional car parking spaces and a stormwater management system. 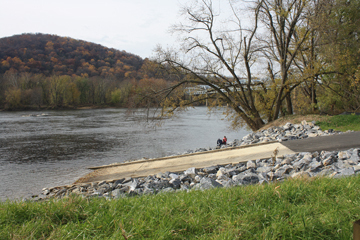 The boat ramp faciilty opened in late October 2011 and was an immediate hit among fishermen and recreationists. It provides easy access to the C&O Canal towpath for cyclists.